The US mint has recently redesigned denominations of currency to make it harder to counterfeit. But, the USA is now the only developed nation that does not color code the different denominations. Examples: bills from Bolivia (shown to the left) and Euros (above) that are color-coded and different sizes. The new Euro bills not only use color-coding, but the bills are even different sizes. Cashiers can see at a glance which bill was handed to them by the customer. There will be less confusion by customers and less mistakes of handing someone the wrong bill. Now, about 'facing money' - this is the task that cashiers in retail and fast food do at the end of their shifts - they must turn each bill so it is right side up and so all bills are facing the same direction. The new bill is identical on the front and back - in fact, there is no longer a front and back - just two sides to the bill. It is also the same layout if the bill is rotated - so there is no longer a top or a bottom. The combination of a serif typeface and a sans serif typeface enhances legibility. A engraving of a government building (the White House in this case) maintains tradition and all the required numbers are signature are included. • The typography and layout enhances readability and clarity. • No more 'facing money'. • Folded in half one can still read 'Twenty' either in numbers or in text. • Folded in quarters one can still read 'Twenty' no matter which section is exposed. • Each denomination is a different color. Whoever redesigned the US currency to thwart counterfeiters probably did just what the government asked them to do; just what the client wanted them to do. The above proposed bill can accomplish that but this designer went beyond the given problem. The new bill is much better - it addresses and solves several problems. 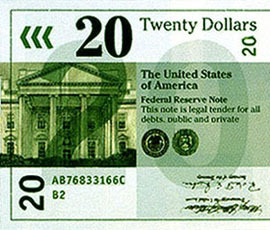 No top or bottom, no front or back, no more facing money, easy to see the 20 no matter how the bill is folded - in half or in any quarter, easy to read, and color-coded to minimize transaction errors.